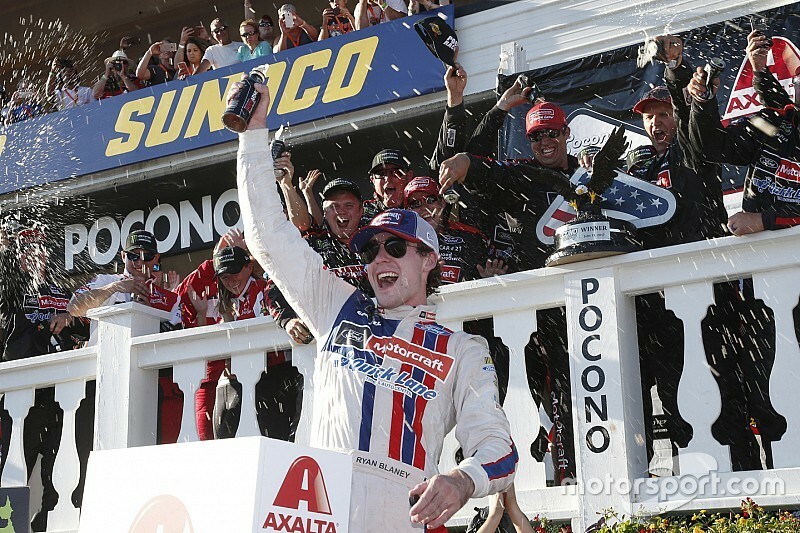 Ryan Blaney vowed to deliver the Wood Brothers their 99th career NASCAR win this season. On Sunday, he carried the venerable No. 21 Motorcraft Ford back to Victory Lane at Pocono Raceway for the third time at the 2.5-mile track and the first time since Trevor Bayne won the 2011 Daytona 500. “I cant believe it,” Blaney said. Blaney, 24, was the third first-time winner of 2017. Kevin Harvick was second followed by Erik Jones, Kurt Busch and Brad Keselowski. "It's a hard one to process," Blaney said in an impromptu interview in Victory Lane with fellow Cup driver Brad Keselowski, who was quickly added to Fox Sports announce team after Blaney took the checkered flag. 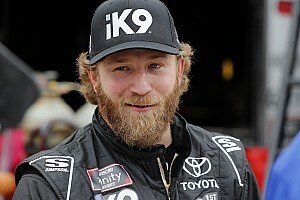 "First, we had to pass Kyle (Busch), he was older tires and he was struggling on older tires. "Then, we had to hold Kevin (Harvick) off. He was really fast all day. I just didn't want to make a mistake - that would have been the worst thing to do. I have to thank him for racing me really clean. "It's the Wood Brothers' 99th win and that's really special and it was a lot of fun." Keselowski then asked what the party was going to be like and Blaney responded, "Well, you're invited! I'm definitely going to party with these guys (his team) because they're a great group. We've had a lot of bad luck the past month-and-a-half, and it's great to be back to where we should run. "This is really cool, really cool." Kyle Busch took the green flag with 54 laps remaining in the Pocono 400. Erik Jones lined up second followed by Denny Hamlin, Ryan Blaney, Danica Patrick, Paul Menard, Daniel Suarez, Trevor Bayne, Michael McDowell and Ricky Stenhouse Jr.
Blaney quickly moved up to second on the restart. After the first five laps, it was Busch, Blaney, Jones, Truex, Patrick, Kurt Busch, Menard, Bayne and Chase Elliott. With 40 laps remaining, Busch held a 4.4-second lead over Blaney with the No. 21 Wood Brothers Ford closing in. Jones ran third followed by Truex, Kurt Busch, Elliott, Hamlin, Larson, Harvick and Keselowski. The leaders started pitting on Lap 123, first with Jones, Blaney from second-place on Lap 124 followed by Harvick, Bayne and Menard. Kyle Busch pit from the lead on Lap 125 turning he lead over to Truex. Truex led five laps before pitting on Lap 129. On Lap 130, Keselowski took the point followed by Ty Dillon and Stenhouse. All three drivers had yet to pit in the segment. Busch passed Stenhouse, then Dillon but when Keselowski crossed the line on Lap 135, he held an 11.9-second lead over Kyle Busch. Dillon pit on the same lap. Stenhouse came to pit road one lap later. With 20 laps remaining, Keselowski relinquished the lead to pit. Kyle Busch took the point followed by Truex, Blaney, Harvick, Kurt Busch, Larson, Elliott, Jones, Hamlin and Logano. Busch had a 7.8-second lead over Truex. The fourth caution occurred that same lap when Kasey Kahne hit the wall in Turn 1. He was running 19th. Busch remained on the track along with Keselowski. Jones, who took right-side tires, was the first car off of pit road followed by Blaney, Truex, Harvick, Kurt Busch, Stenhouse, Elliott, Hamlin, Larson, Menard, Kenseth, Logano, Austin Dillon and Danica Patrick. 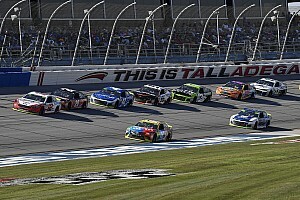 Twenty-four cars remained on lead lap when the race returned to green with 13 laps remaining. Busch extended his lead as Blaney rolled past Keselowski and Jones for second. Harvick was fourth followed by Keselowski on Lap 148. Kurt Busch, Truex, Elliott, Stenhouse and Hamlin rounded out the top 10. With 10 to go, Blaney moved to the inside of Busch for the lead with Harvick passing Jones for third. Harvick passed Busch for second on the next lap. With seven laps remaining, Busch dropped to fifth on old tires. Blaney’s advantage was 0.487-seconds over Harvick followed by Jones, Keselowski and Busch. Blaney had a two-car lead on Harvick coming to the line with four laps remaining. Harvick continued to stalk the No. 21 Wood Brothers Ford all the way to the white flag. Blaney beat Harvick to the line by 0.139-seconds. Truex, Larson, Elliott, Kyle Busch and Kenseth rounded out the top 10. Busch’s 100-lap led were a race high. There were 13 lead changes among nine drivers. 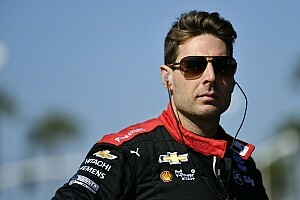 The race was slowed by four cautions for 18 laps. Harvick rallies for second at Pocono but "should have blown up"